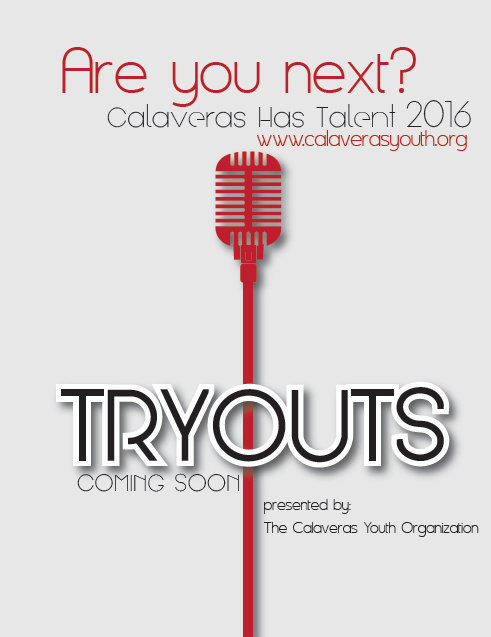 Calaveras Has Talent 2016 Audition Information:Calaveras Youth Organization will be having Auditions for Calaveras Has Talent Show at 8 different venues starting in April 2016. Auditions are for all ages. Categories include Vocal Peformance, Dance, Bands, Duos, Groups, Magic, Comedy, Instrumentals and the ever popular Yo-Yo. Valley Springs – April 23, 2016 at Valley Springs Elementary Multi Purpose Room. Murphys – May 7, 2016 at the Michaelson Elementary Multi Purpose Room. Mountain Ranch – June 11, 2016 at the Mountain Ranch Community Hall. 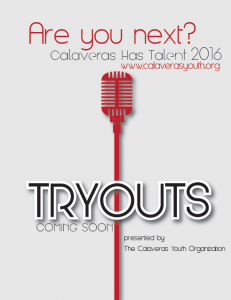 Rancho Calaveras – June 18, 2016 at the Jenny Lind Elementary Multi Purpose Room. Contact us at [email protected] or call (209) 286-6715 or visit us at the Calaveras SAVE Campaign Page on Facebook.